Click here to see Catherine's services and book Online! 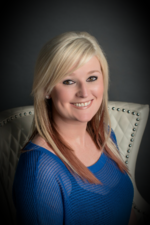 Catherine attended from Paul Mitchell the Schoo-Houston in 2009, and is also a licensed cosmetology instructor. Catherine has a passion for color. She loves expressing her creativity to five her clients a beautiful end result that is conscious of their lifestyle, maintenance, and budget. She specializes in blonding, balayage, and vivid's color. Catherine also loves precision haircutting, texture, and styling services. She is a certified Dreamcatchers extension stylist. Catherine's clients range from 2 years to 74 years old. Wheather your style is conservatinve and professional, or modern and edgy; Catherine can create something that matches your vision. To see pictures of Catherine's work and take advantage of her promotions visit her facebook page - Salon Chroma. Clients have busy schedules and Catherine offers late appointments to accomodate their needs. Making an appointment is simple with either texting or online booking via styleseat. Treat yourself to a SALON CHROMA experience. "Thanks so much for my cut and color! Catherine did great job and made me feel comfortable as a new client." "Catherine is very personable, professional, and made my experience enjoyable! I appreciated how she was both knowledgable and intentional in how she approached my color and cut. I'm happier with my hair now than I have been in a very long time. Catherine was highly recommended to me and I was not disappointed. Though I was somewhat apprehensive about having my hair done again by someone new (after some bad experiences), I am confident to trust her with anything related to my hair in the future, and will recommend her to others. :)"
"Getting my hair cut by Catherine was a great experience. I went to her because I was looking for a new hairstyle. Yes..... I was nervous because I have not changed my style in over 15 years. She was able to keep me calm by letting me know what styles would work before we started. She was recommended to me by a friend. I am very happy with the new style and professionalism. Thank you Catherine with Salon Chroma. " "Love Catherine! She does a good job on my hair for a very reasonable cost, and is honest about what she thinks will or will not work for me. " "Great personality, professional , great colorist, very accomidating." "I love Catherine Smith! Definitely book your next appointment here! Catherine fit me in for a last minute highlight and was fabulous! Its been really hard for me to find someone good at doing my blonde hair, happy to have found Catherine! " "Catherine is so sweet and did such a great job on my daughter's haircut! She loves it! " "Asked questions about my preferences. She was very efficient yet paid a lot of attention to every detail . She was very engaging and personable." "She was very professional. Knowledgeable about good products. Gave me great advice and info about how to maintain my hair healthy. Very professional. " "Catherine made me feel relaxed and she gave me confidence that she knew what she was doing. I haven't had my hair cut in years and I enjoyed my visit." "Very knowledgeable and very friendly. Love the work she does"
"Catherine is very good at her job which is to make us look great! She does great work at a reasonable price. Thank you." "Catherine is always pleasant company. She does a great job because she loves what she's doing and she's genuinely concerned about others. It's always a professional environment. I'd have no trouble referring anyone to Catherine. " "Catherine is awesome! She is very warm and sweet. She listens to her clients and makes them feel right at home. She even went over some different dying techniques that would look good on my hair. She takes the time to listen to what you want and does her best to give you exactly what you want!! " "I went in for a consultation. I told her exactly what I was wanting, she made notes and listened. We have a plan for my appointment. " "It was amazing! I absolutely love it. "